NOTHING happens in ANY business until something is sold. So when the economy, increased costs, increased competition, and dwindling call counts fall on your business, what do you do? How do you survive? Do you act like a victim? Or do you take right action and do something about it? When you keep focusing on the same things, you get the same results. You need to change things up and focus on the only thing that really drives profit… selling. And how do you increase sales proficiency? Mastery level sales training! Because everything in the contracting business today costs much more than it used to, many “financial types” in this industry use this fact as an excuse NOT to invest in sales training. They look at it as just another expense instead of a proven method of increasing sales and profits. This kind of thinking is like trying to dig your way out of a hole. Our Total Immersion Sales Training predictably produces results for our clients that would blow you away. One firm we worked with recently, after just one year of using our system, enjoyed a 100% boost in sales, and nearly a 10-fold bump in profit. Just as important, although overhead dollars increased slightly due to doing more business, the percentage of overhead in their budget dropped 10% due to increased profitability. The impact of higher sales revenue sold at a higher margin can literally change the dynamics of a company over the course of a year. Even a very conservative 10% improvement in revenue with no internal organizational changes will still result in a 4% drop in overhead and add 6% to the bottom line. If you don’t invest in getting better results, how are you going to actually get better results? The results fairy isn’t going to show up and whack you over the head with a magic profit wand. If you want different results, you have to do something different. What would doubling your sales with no increase in staff or overhead do for your business? Sales training (GOOD sales training) is an investment, not an expense. I can tell you from experience which is worse. I can also tell you that it’s a fact that companies who invest in training their employees retain their employees at a far greater rate than those who don’t. If you think training your people is expensive, consider what it costs to onboard a new employee, have them leave out of frustration, and then repeat the whole hiring and onboarding cycle over and over. I encourage you to actually do the math on this. It’ll shock you. Now, imagine if you could turn your underperforming employees into top performers instead of replacing them. How much would you save every year? Every five years? It’s not only possible… it’s predictable. Our Total Immersion clients have done it consistently time and time again. And we’re talking about all kinds of different firms in different markets. It flat out works. Can Sales Training Really Buffer Marketing Costs? We can all agree that marketing is expensive already, and it’s getting more expensive every day. Making the phone ring can really put a strain on the budget. It’s not uncommon for contractors to lay out $300 or more to get a customer to call them for service. You can’t afford to lose your current customers because they’re ridiculously expensive to replace. You need to sell more on each call to cover the growing expense to advertise your services. It makes sense, right? If you don’t lose your current customer that you paid big bucks to acquire, you won’t have to spend the money to replace them. Additionally, with a quality sales training program, if you can increase sales by as little as 30% with the same employees, the resulting profit will not only add money to the bottom line, but it will reduce the percentage you’re spending on advertising. And by the way, a 30% increase in sales would be considered a modest increase using our Total Immersion Program. You can do much, much better than that! 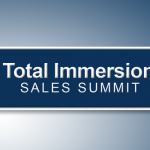 The average Total Immersion attendee is doing $1,637 per call as a tech and $8,566 as a salesperson. By comparison, if your average tech call is $500 or less, then you need to close more than 3 calls to make up for 1 Total Immersion attendee’s call. If your average equipment sale is $4,500 then you have to make 2 sales for every 1 made by an average Total Immersion attendee. Think about what numbers like those could mean to your bottom line. What if your techs could run 3 calls instead of 6 and still double their production? What if your salespeople could do the same? I’m here to tell you it’s not a “what if.” Our Total Immersion graduates are doing it every single day. When they’re stressed and hurried because they know they have 5 more calls to get to? Or when they have all the time in the world to focus on the customer in front of them because they have confidence that they’re going to sell more jobs more often? The answer is clear. More quality sales lead to better job quality every time. At the end of the day, if your business is struggling, you have to make a choice. If you’re behind your sales budget, pouring too much into overhead, and your call count is dwindling, you have only four strategies to choose from. Unfortunately, this is what most contractors choose. They cut expenses, hunker down, and hope for “it” to pass. (Whatever “it” is.) They put their heads in the sand, keep doing the same old stuff that got them into trouble in the first place, and hope that somehow, the universe will magically reward them with a flood of phone calls… some day… for some reason. Manufacturer training is based on how to sell the benefits of one specific brand of equipment. It focuses on moving units of their equipment – not on how to sell YOUR services. Manufacturer training teaches you and your competitors to be exactly the same and really does nothing to help you become the key player in your market. The bottom line is that manufacturer training is better than no training… but just barely. These groups use general best practices to train each other on selling services. And, actually, this is a decent starting point. These groups do help you begin to differentiate your service from your competitors. Think of it as sales training 101. The only downside is that since these groups cover so many industry topics, they’re not able to really drill down and focus entirely on increasing sales. The best of the best in every walk of life have mastery level coaches and trainers. Big time personal trainers have their own personal trainers. Millionaire golfers have putting coaches. Why should a world-class contracting business be any different? And as far as mastery level sales training in the contracting business goes, there’s really only one answer… our Total Immersion Program. If you’re ready to make an investment in your people, your business, and yourself that will pay off big time and grow your bottom line – and if you’re ready to create higher value so that your employees and customers all receive top value from your company – then you really should take a serious look at our Total Immersion Program. We’re currently accepting reservations for our 2017 Total Immersion Sessions. There are several dates available, one of which is bound to work for your team. To get all the details on the Total Immersion Sessions coming up, and to save your spot, click here. And if you have any questions about the program, please call us today at 877-764-6304. Let’s make 2017 your most profitable year ever!